Roman Catholic auxillary bishop, Donal McKeown demanded that he was referred to as “president” when he was principal of St Malachy’s College in Belfast. 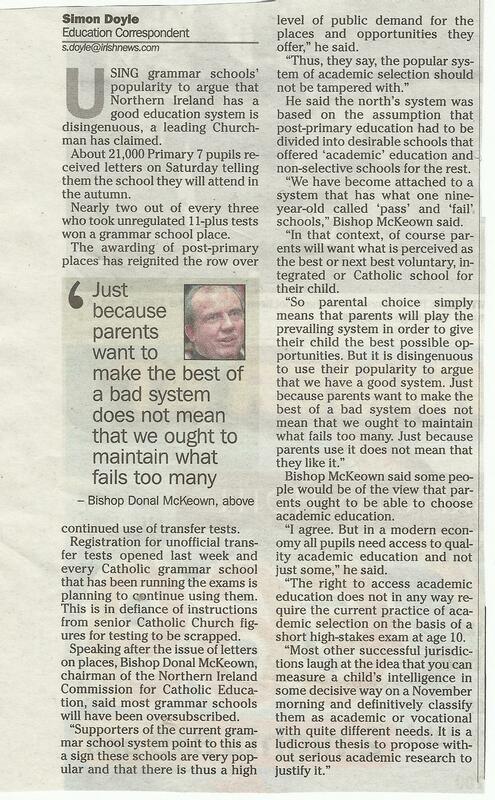 Therefore his attack on parental choice for 11-plus testing and academic selection in the Irish News (subscription required) May 28th 2013 smacks of yet another slathering of hypocricy from the Catholic hierarchy. No person shall be denied the right to education. In the exercise of any functions which it assumes in relation to education and to teaching, the State shall respect the right of parents to ensure such education and teaching in conformity with their own religions and philosophical convictions. The Bishop may recall that it it this very same convention that his Catholic Church relies upon to maintain their separate schooling system. Parents will not miss this attack by the Roman Catholic church on the parental role as prime educators of their children. The attack on parental choice is led by a group of non parents, their spokesman a former grammar school principal who has, like many grammar school principals, failed to represent the interests of all pupils by defending the right of parents to choose.